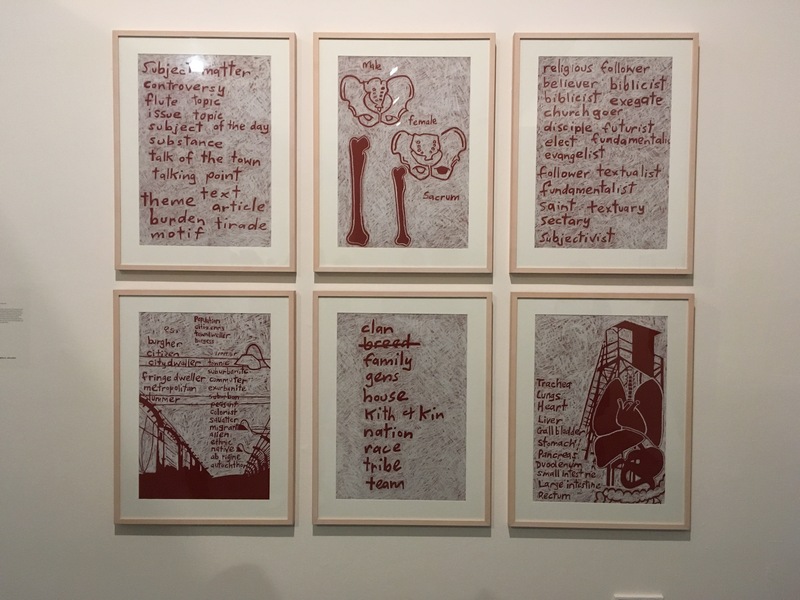 PICA is now exhibiting a collection of small sketches and typographical pieces, produced by Indigenous artist Gordon Bennett (1955-2014). The tongue-in-cheek title, “Be Polite”, for the exhibition, is reflective of the ironies and frustrations of needing to criticise racist practices, but being self-consciously held back. The opening pieces displayed in the gallery, pictured above, are emblematic of the this restraint, but once you enter the room, Bennett’s work becomes far more frank. Bennett’s repeated “ABCD” of anti-Indigenous slurs, droplets of blood, and sharp depictions of sexual violence as well as murder committed against Indigenous Australians are confronting in every sense of the word. The importance of language as a means of perpetuating abuse is a recurring theme. In the distributed flyer about the exhibition, the curators observe that the collection has a “conversational” tone to it, as if the artist is speaking to his own work. In addition, the flyer notes that the works on display were never originally intended for show. However, there is much to be shared within them. Bennett’s choice of media in this exhibition is varied. Stark sketches and selective uses of colour are used to stage a sharply critical dialogue with historical events. 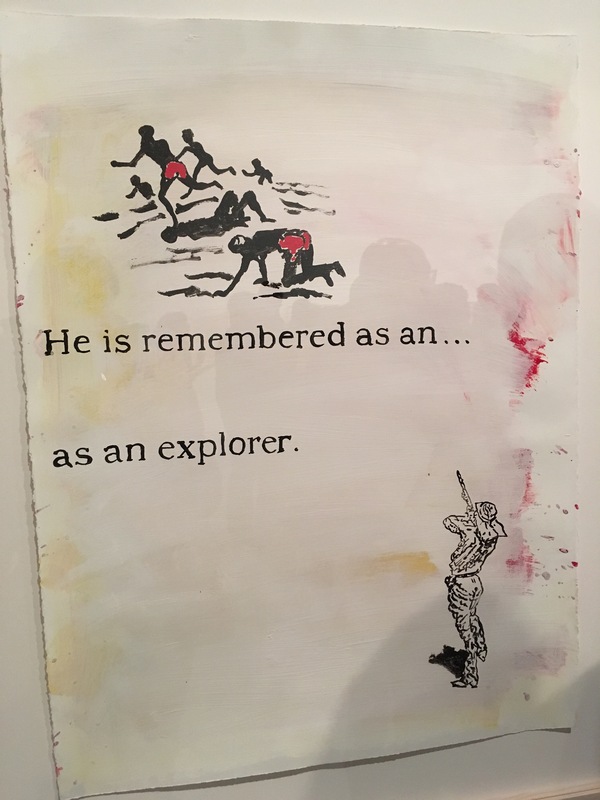 The history of colonialism in Australia is presented in a series of storyboard-esque images, bitterly contrasting the personification and aggrandisation of violent colonial oppressors with the brutalised Indigenous figures. Issues of voice and silence are repeatedly revisited. This is a collection that speaks with numerous voices, but at the same time, is revisited by the overarching, wry reflection: “be polite”. How can you be polite in such weighted conversations? Bennett’s answer appears to be that you cannot. Platitudes are spelt out in advertising-style drawings, and denounced as part of the refrain of racist terminologies. This is a collection geared to unsettle, challenge, and at the same time, to demand discussion. Confronting and compelling, I would highly recommend visiting. Siobhan Hodge has a doctorate from the University of Western Australia in English. Her thesis focused on Sappho’s legacy in English translations. She is an Associate Editor at Rochford Street Review, Reviews Editor for Writ Review, and contributing reviewer for Cordite. Born in the UK, she divides her time between Australia and Hong Kong. Her chapbook of reflections on Sappho, Picking Up the Pieces, was published in 2012 as part of the Wide Range Chapbooks series. She has also had poetry and criticism published in several places, including Westerly, Limina, Colloquy, Cordite, Plumwood Mountain, Page Seventeen, Yellow Field, Peril, Verge, and Kitaab.